Here are some new Mustang pictures that'll make you want to check out the dealer's showroom and see the awesome 2011 Ford Mustang. These images could make for some great Mustang wallpaper too! 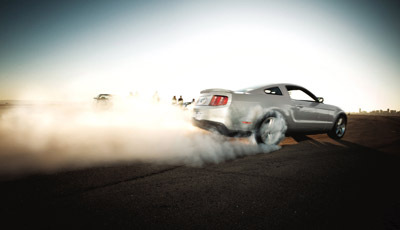 The photographers must have used up several thousand bucks in tires, judging by all the rubber on the tarmac from all of the burnouts and donuts made to get these pics! 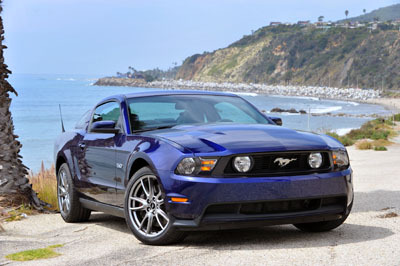 Or maybe a trip to the beach with your deep blue new Mustang GT. 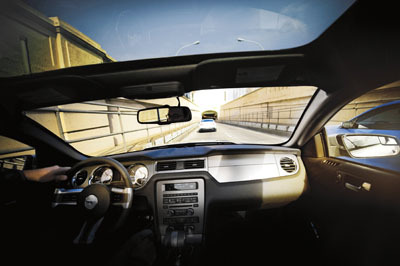 The new Mustang glass roof option, called the panoramic roof lets the sun shine in without the wind. The new Mustang for 2011 is a model of muscle and sophistication, with either the 305 horsepower V6 or the 412 horsepower 5.0 liter V8. Stay tuned. More will be coming! 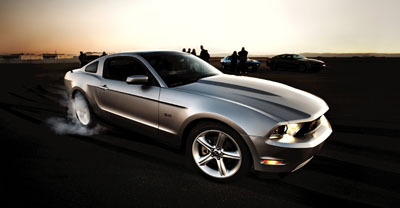 For more detailed information on the new 2011 Ford Mustang, check the link below.